Do you struggle with hearing loss? Are you missing out on conversations, or finding yourself falling behind in social situations? The truth is that hearing loss affects far more than your ears, and if you want to lead a healthy and happy life, the first thing you need to do is treat your hearing loss. Living with untreated hearing loss can set you up for a lot of health problems, according to a recent study published in JAMA Otolaryngology-Head & Neck Surgery. Hearing loss can lead to negative health outcomes, and of the 200,000 people in the study suffering from hearing loss, many struggled with other health issues including injuries such as broken bones or sprains, increased risk of falls, more heart attacks and strokes, and a greater risk of depression and dementia. 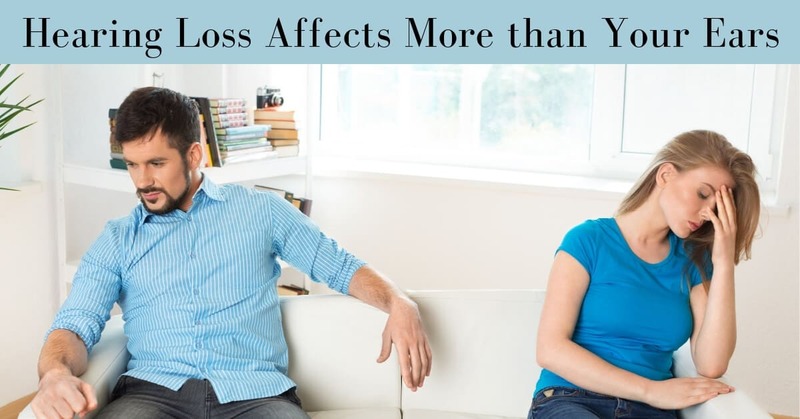 Leaving your hearing loss untreated will affect far more than your ability to communicate with loved ones, but you’ll be risking some serious health problems. One of the biggest challenges faced by those with hearing loss is social isolation. When you’re struggling to communicate, it’s normal to feel uncomfortable in social situations where you aren’t able to follow conversations, or hear what’s been said. Many people with hearing loss choose to stay home rather than facing their friends, straining to hear, or risking embarrassment by mishearing a question and answering inappropriately. When you choose to stay home, you might think you’re making a good decision, but when you’re not getting out as often as before, your brain and body suffer. You’re not receiving good social support, and you’re more likely to be lonely, stressed, or depressed. One study by the National Institution of Deafness and Other Communication Disorders (NIDCD) discovered that 11% of people with hearing loss also suffered from depression! “We found a significant association between hearing impairment and moderate to severe depression,” said Dr Chuan-Ming Li from NIDCD. Not only that, but you won’t be exercising your body or your brain. You’ll start to feel less mobile and independent, and as your brain isn’t hearing all the sounds around you, or getting exercised in conversations, you’ll start to notice rapid cognitive decline. This can lead to dementia or even Alzheimer’s Disease. Another link you might not have thought about is the connection between hearing loss and risk of injury. Many studies have found that those with hearing loss have more accidents. Professor Neil Bhattacharyaat from Harvard Medical School explains. When your hearing isn’t in tip top shape, you miss a lot of the sounds around you, fail to hear a warning sound altogether, or can’t tell where a sound is coming from. “As a special sense, hearing has a tremendous protective role,” says Bhattacharyaat, and when you’re not able to hear a car honking, emergency sirens, or someone yelling from across the street, you’re more likely to have an accident or injury. If you want to maintain your quality of life, and avoid the negative outcomes of hearing loss, the first thing you’ll need to do is treat your hearing loss with a quality pair of hearing aids. Then follow these steps to stay active and healthy. Learn to talk about your hearing loss, and tell others when you’re struggling to hear. Your friends and loved ones will be happy to make small adjustments to help you participate in conversations and enjoy social events. Don’t isolate yourself, but reach out to a support group and find other people that have gone through the same challenges that you are facing. Tell your employer that you’ve been struggling to hear, but be sure to tell them you’ve taken the first steps in getting a hearing device. Exercise caution, and listen carefully for any warning sounds in your environment. At My Hearing Centers we’re dedicated to helping you hear. Visit us today for a hearing test, and find the hearing device that will work for you. We’ll help you maintain your device and monitor your hearing health, so you’ll always have the best in sound quality, and can enjoy a happy and healthy life.